Graphic Design | Charles Nix, AAS Faculty: An award-winning 1000-page dichotomous key? 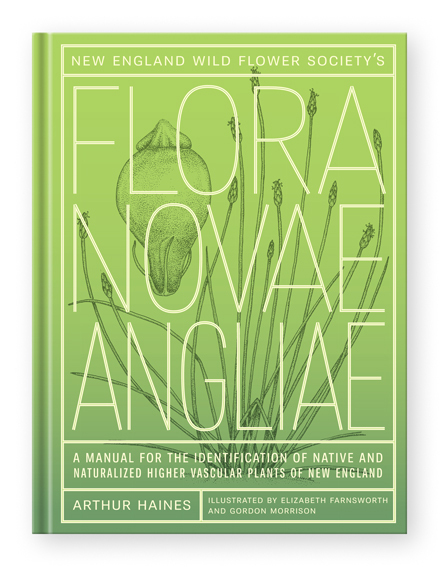 The jury of the 2012 Type Directors Club design competition (Eric Janssen Strohl, Kevin Smith, Jason Schulte, Jason Santa Maria, Louise Fili, Ray Fenwick, and Frank Chimero), have selected my design for the Flora Novae Angliae by Arthur Haines (Yale University Press, 2011). Needless to say I’m a proud papa—and pleased that the jury would choose to award such a dense typographic labor of love. The Flora is a thousand-page dichotomous key—a very long “if/then” statement (“If your plant reproduces by spores and does not produce seeds and fruits, then go to page 2. If your plant has stems that are conspicuously jointed…then go to page 58.” and so on.) It’s a tool for botanists in New England to identify all plants, from a specimen in hand to the Latin species (and sometimes subspecies) name. The book is copiously illustrated with exquisite black and white line drawings by the amazing illustrators Elizabeth Farnsworth and Gordon Morrison, and is set in 8/9.75 pt ClearviewText Light, designed by James Montalbano. It was printed and bound by Courier Printing in Westford Massachusetts. ‹Previous Post Process and Skills Course: Online or On-site, what is the difference? Congratulations! Well deserved! So proud of you.